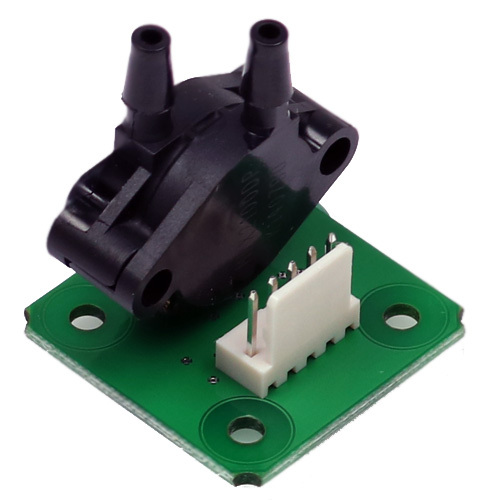 These pressure transducer moduls with combined digital (I²C) and analogue (0 .. 5 VDC) outputs are ideally suited for measuring static and dynamic relative pressure in liquids and gases. The pressure transducer modules of the DRMOD-I2C series transfer the measuring value as a calibrated and temperature compensated I²C digital signal. A second analogue output provides the measured values as linearised signal 0…5 VDC. A Microcontroller or Pressure controller can then directly read the pressure values via a 5-pin board connector. The probe housing is made out of light metal (aluminium). The connection to the medium takes place over a hose connector 4/6. These transsucers show a high chemical resistance, however we recommend to make a media compatibility test especially if critical media like e.g. in electroplating applications (iron trichloride) or oils with undefined additives are used.